We’re back at the Collision Industry Conference today in Detroit for the second day of the two-day event, and we’re going to help repairers who aren’t there keep up with the action. Highlights Tuesday included a parts procurement discussion that examined how small inefficiencies can cost your shop. Brandon Thomas of GMG Envirosafe will follow that at 10:30 a.m. with his look at protective garments. Get more details here about the highlights Wednesday as well as information about the Society of Collision Repair Specialists open board meeting Thursday. Starting at 8 a.m., check here for a real-time feed of what’s happening at the COBO Center. 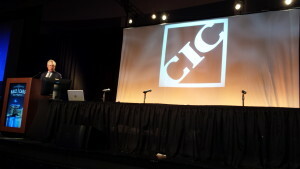 Join in the conversation with #CICDetroit or follow us on Twitter with @repairerdriven.